The City of Tacoma has known about the business killing effect of the city portion of the B&O tax effect for years. Yet, year after year, no one has had the leadership in the City to do anything about it other than watch as one after another business leave the City of Tacoma for an adjacent city such as Lakewood, University Place, and yes: the City of Fife. Amending Chapter 6A.30 of the Municipal Code, relating to the Business and Occupation Tax, to increase the annual gross income taxable minimum threshold from $75,000 to $250,000 beginning January 1, 2011; and adding a credit to incrementally increase the taxes paid for gross income over $250,000 and up to $300,000. Although this is a long ways from removing the tax, it is at least a symbolic start. Only a micro business would be fully exempt from the tax. Any small business with any employees would be far over the $250,000 threshold. by fredo on 11/22/2010 @ 6:36am This is a good first step and I urge the council to adopt the change. by Jesse on 11/22/2010 @ 7:31am ... and Fife wept. by fredo on 11/22/2010 @ 7:39am Fife shouldn't have to worry. The type of businesses which are setting up shop in Fife to avoid the Tacoma B&O aren't the $250K threshold type businesses. The only businesses which will be affected are some small mom & pop, existing and startups. If the city council wants to attract businesses which will bring family wage jobs the threshold is going to have to be $1M or higher. Still, the proposal is a good one and should be adopted. Marty, can we count on your vote? by Erik on 11/22/2010 @ 10:21am Allowing a ton of small businesses not to have to mess with the forms would be nice even if they don't end up paying much tax. Another small step in making Tacoma "Open for Business" rather than the City of Perpetual No. by Marty on 11/22/2010 @ 11:52am There will be no vote on Tuesday, it is the first reading of an ordinance change. The vote is next week. It is not in "critical condition" as this is broadly supported by the council. I do not consider this as symbolic because, it will relieve the B&O tax burden for nearly 5000 employers and be the first step for continued reduction and complete removal of the B &O tax. I am either primary or co-sponsor to both tax reduction measures, so Yes you can count on my vote. "This supports small businesses and is a long-term strategy to make Tacoma a desirable place to do business," said Tacoma Mayor Marilyn Strickland, who presented a plan to change the tax policy. "It sends a positive message about Tacoma's business climate and encourages entrepreneurs in Tacoma." She added that the city could see some revenue gains if small businesses decide to open in Tacoma because of the B&O tax change. And for businesses that were once below the $250,000 threshold but go on to exceed it, the mayor would like to see them eased back into the system: businesses earning $251,000 to $259,000 would pay 10 per cent of the B&O tax due; $260,000 to $269,000 would pay 20 per cent; $270,000 to $279,000 would pay 30 per cent; $280,000 to $289,000 would pay 55 per cent; $290,000 to $299,000 would pay 75 per cent; and businesses earning $300,000 or more would pay 100 per cent. by Erik on 11/22/2010 @ 1:16pm I do not consider this as symbolic because, it will relieve the B&O tax burden for nearly 5000 employers and be the first step for continued reduction and complete removal of the B &O tax. That is good news. One step at a time. Perhaps the council will increase the threshold next year. @Fredo: You are right that most if not all of the business we have read about moving to Fife have been far above the $250,000 threshold. However, one has to start somewhere. by Marty on 11/22/2010 @ 2:49pm Let me be clear, Mayor Strickland did alot of the work on the B&O and it would not be up for the vote if not for her leadership. Other councilmembers were also very involved in the process. I am primary sponsor for the cabaret tax removal and worked to bring it up to the attention of the council. by fredo on 11/22/2010 @ 4:30pm Well if this goes through I will definitely have to temper my remarks about our good mayor in the future. I don't know what the cabaret tax is, but if its a bad thing let's get rid of it. "This similar in form to what we did in the early 90's. Setting a threshold and adjusting rates. It was the intent that this ordinance would reviewed and changed on a timely basis. Obviously this didn't happen. Kudos to mayor Strickland. Previous mayors have not wanted to address this issue. It is time to have a serious discussion before we lose more businesses." by fredo on 11/22/2010 @ 6:12pm Certainly the periodic B&O threshold reviewal that Karen Vialle described would have served Tacoma better than what we actually did. However, we shouldn't waste too many years fiddling with the threshold level. The modification under discussion should be the first step in abandoning the tax. What it all boils down to is this. Does Tacoma want to roll out the welcome mat for prospective businesses or would we prefer to have them step in a pile of doo doo? 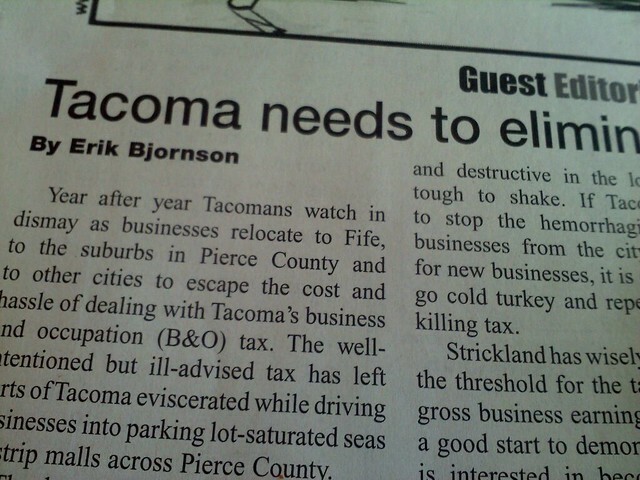 by Erik on 11/23/2010 @ 11:27pm Update on the effort to eliminate City of Tacoma portion of the B&O tax. Click on the November 23, 2010 hearing link. Then click on Ordinance 27958 for comments by city staff, councilmember Campbell and Mayor Strickland. Tonight was the first reading. Presumably, the final reading will be next week at which time there will be a vote on the issue. Tacoma City Council is expected to vote today on an ordinance that would modify a nearly-60-year-old law that has governed how City Hall collects revenue through its Business and Occupation (B&O) tax. According to the city's tax and license division, if you are a business owner who earns $75,000 or more in gross revenue this year, you are required to pay the tax (last year, the figure was $72,500). The ordinance before city council would raise the annual gross income threshold from $75,000 to $250,000 beginning in 2011. If council changes the ordinance, approximately 4,900 business owners who fall below that threshold would essentially receive a break on their B&O tax bill, according to Tacoma Mayor Marilyn Strickland. Mayor Strickland is co-sponsoring the ordinance with Deputy Mayor Jake Fey, Councilmember Ryan Mello, and Councilmember Marty Campbell. City Council's Government and Performance Finance Committee approved a 'do pass' recommendation of the ordinance earlier this year. If approved, notices advising business owners of the change would be mailed Dec. 15, and the change would be implemented Jan. 1, 2011. Kudos to Erik Hanberg who spoke for the resolution during public comment period. It appears the B&O tax measure passed! Tacoma has taken an additional step toward making the city "open for business." Mello: thanking everyone for making this happen. Pointing out that we will be saving on paperwork. Campbell: in these times cutting taxes is rare. Would rather we moved faster, but happy to make a change. My microwave nukes my wireless. Missed that last bit. Mello is asking for more info about "the TCRA"
There is practically no one in the audience. purchase resolution adopted. Councilmember Boe is speaking about how nice the Spanish Steps are looking. have moved on to approving purchase resolutions, expenditures for spanish steps restoration, security officers at the landfill. Erik spoke in favor of the resolution, that's it for public comment. A couple council members discussed (smart) plans to raise the threshold further in the future. One small but important step. by fredo on 11/30/2010 @ 9:26pm "security officers at the landfill." In todays economy it's important to prevent people from stealing our garbage and yard waste. by fredo on 11/30/2010 @ 9:46pm "Lonergan: supportive but wishes we could move more slowly"
I guess 50 years of foot-dragging was insufficient for Mr. Lonergan. by fredo on 12/1/2010 @ 3:26pm According to the News Tribune, the b&o proposal was approved. Bravo, Mr. Urbanist and thanks for your considerable effort to bring this issue to light. by Erik on 12/1/2010 @ 4:04pm Bravo, Mr. Urbanist and thanks for your considerable effort to bring this issue to light. Thanks. A small step toward making Tacoma a place businesses would seriously consider locating to. Let's make it a goal to increase the exemption to $500,000 to $750,000 next year. Not a bad question to ask political candidates. On Nov. 30 Tacoma City Council approved an ordinance that alters the business and occupation tax. Formerly, businesses with annual gross income of $75,000 and above were required to pay the tax. As of Jan. 1 that threshold will be raised to $250,000. �I think it is something we really need to show Tacoma is open for business,� Councilmember Marty Campbell. �I think it is a smart move for Tacoma,� Mayor Marilyn Strickland remarked. She noted of cities in the Puget Sound region with a B&O tax, Tacoma will have the highest threshold for exempting businesses from paying.